The 1918 island house served three-season and vacation purposes for decades, but the years took their toll. Now, the house is getting a complete makeover, including comprehensive structural reinforcement and a thorough above-code energy upgrade. Board sheating visible here will be retained, covered with air-tight impervious membrane, and over-insulated with three inches of high-density polyurethane foam. This perspective view of the house early in the project shows several aspects of the planned comprehensive makeover. The unreinforced block foundation at bottom will be undermined and supported from below with a new poured concrete footing, then insulated and frost-protected with below-grade wing insulation. The newly framed and sheathed corner was previously part of the wrap-around open porch, but will now become enclosed and conditioned living space. The complex framing of the second-story roof and dormers has been pulled back into shape after years of sagging and slumping, and will be deepened, reinforced, and heavily insulated. Another dormer will be added at the back of the house, and skylights will be included in the roof plane shown here. 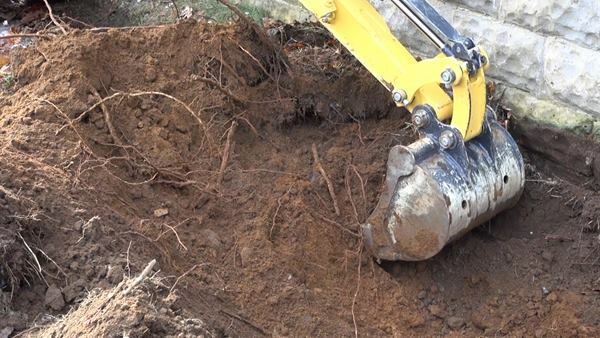 Carpenter Shane Fenton excavates next to the block foundation with a mini-excavator. To place the new foundation under the existing block, the crew will dig down to the level of the lowest course with the excavator, then hand-dig under the wall in four-foot sections to form and place short sections of footing. It will take several days of step-by-step forming and pouring to insert the new continuous footing under the unreinforced block. Fortunately, the existing soil under the block wall is consolidated sandy soil with a good bearing strength, allowing a 16-inch spread footing to easily do the work of supporting the existing block foundation as well as the new framing load to be installed above it. Fenton digs along the base of the wall with the mini-excavator while another crew member hand-digs the last few inches. The ledge on the site is only a foot or two below the lowest course of block in most places, and rises to the base of the wall in several spots. 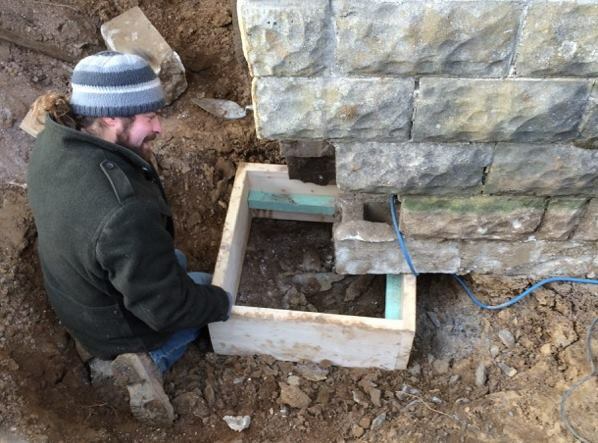 Mason Joe Martignetti hand-digs under the corner of the block foundation wall to start the underpinning work. Martignetti sets a wooden footing form under the foundation. The plan is to dig and form up footings in short sections, pour a section of concrete footing and let it set, then excavate and underpin the next short section, and so on. Another view of the first corner to be formed up for a new footing. Snow, freezing rain, and frost are coming this month, so the crew has set up a temporary plastic shelter around the house perimeter to protect the foundation work. Martignetti works the stiff mortar on the trowel. Martignetti works grout into the crack. 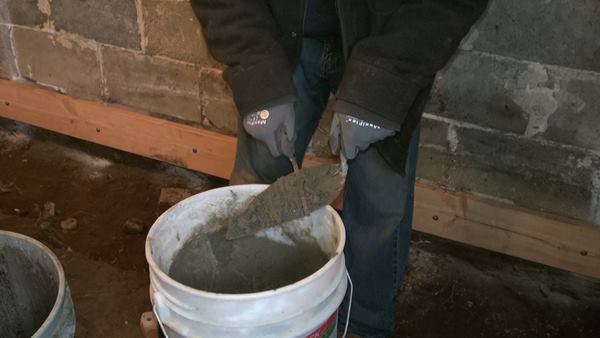 The entire face of the block foundation will later receive a reinforcing parge of modified cement. Thompson Johnson Woodworks lead carpenter Mark Pollard explains the re-worked sill detail for the house. The sill beam, which was found to be suffering from rot in a few limited areas, was jacked up and shimmed straight (if not level). The crew has isolated the sill beam from the block foundation with Grace membrane. The first floor ceiling (second floor frame) of the old house was originally framed with sawn 2x8 boards more than 26 feet long, spanning the entire downstairs of the house. The floor joists had sagged four inches in the middle of the span. 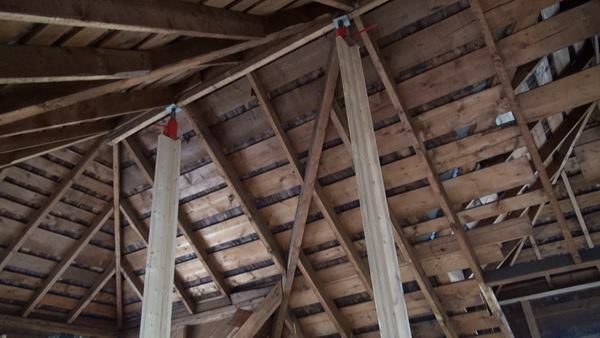 Thompson Johnson cut the joists and two mid-span locations and reframed the floor with two long beams built up with doubled 1.75-inch by 10-inch LVLs, and supported by Douglas Fir posts. In the upper story, long temporary strongback posts topped with bottle jacks were used to lift the ridge of the complex hip roof, while comealongs were used to draw in the kneewalls of the house, which had splayed outward over the years. 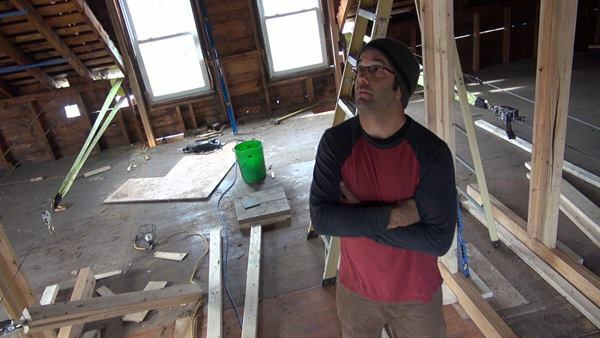 Mark Pollard surveys the complex framing of the old house roof, which has to be pulled back into shape, reinforced, and deepened to allow above-code levels of insulation. At left rear is a set of come-alongs used to haul inward on the house’s balloon-framed kneewalls, which had deflected out severely over a century of service. Coastal Connection will take a closer look at the roof re-framing and envelope energy detailing in a future issue. As a group, builders in the state of Maine take a wide range of positions on energy efficiency. At one end of the spectrum are a handful of companies focused on ultra-high-performance homes (the zero-energy, Passive House crowd). At the other end are a few builders who still aren't happy with the state's decision to adopt the 2009 International Energy Efficiency Code (a move that was required for states who wanted their share of stimulus package money after the 2008 housing market collapse). In the middle are the mainstream builders and remodelers who are sticking to whatever the code requires. And then there's the "pretty good house" movement. "Pretty good house" is the handle coined by a subset of the Maine homebuilding industry who are aiming for the cost-effective "sweet spot" where the cost of energy upgrades will pay itself back through a reduction in the cost of heating systems, along with reductions in operating energy cost. It's hard to be sure where that sweet spot lies, of course, but in Maine, the typical recipe calls for R-20 insulation in the floors, 2-40 in the walls, and R-60 in the roofs. So while "pretty good" falls a tad short of a full-on Passive House, it's well beyond code minimum requirements. Building shells have to be air-tight, but there's no bright-line blower-door requirement. And of course, the design and construction details have to manage the risk of moisture condensation or bulk water leaks. Along the way, Thompson Johnson will also turn the dwelling into a modern, well-insulated building. Walls will get three inches of rigid foam on the exterior and six inches of dense-pack cellulose in the interior framing cavities; the roof will get three inches of spray foam against the sheathing, and a foot of dense-pack inboard of that. The exposed portion of the masonry block basement walls will also get clad with foam, and the new footing will be frost-protected with horizontal wings of rigid insulation below grade. The resulting envelope will cut heating loads low enough that the main heating plant will consist of two air-source heat pumps, rated at 12,000 or 18,000 Btus apiece. The job starts with two structural measures: first, excavating beneath the existing foundation to construct a new load-bearing footing; and second, jacking, straightening, and reinforcing the existing wood frame walls and roof. The existing block walls were laid directly on soil, with no structural footing. But they've held up well over a century, supported by strong sandy soil over ledge, and holding up only a lightly framed house. 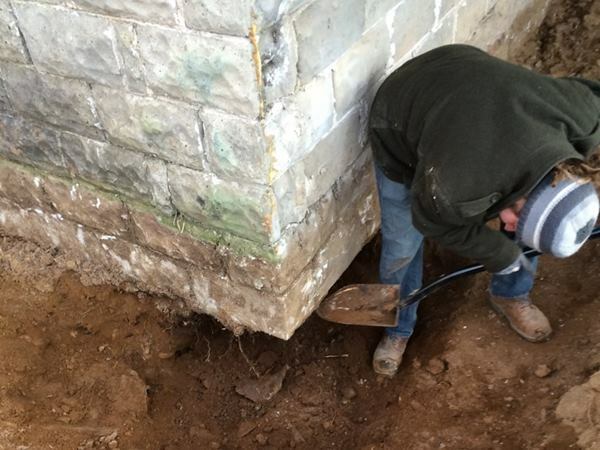 Now, however, Thompson Johnson will excavate to the base of the block wall, dig underneath the block, and place new structural footings, one four-foot section of wall at a time. 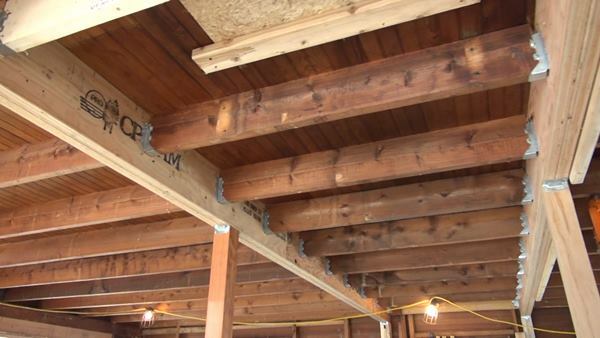 Upstairs, Thompson Johnson has been jacking up sagging floor joists, splitting the longer spans into shorter joist runs, and supporting the floor system using engineered beams. Where the balloon-framed walls have splayed outwards, the crew has winched the walls inward, jacking up the hip roof's ridge at the same time, and inserting new posts into the existing wall framing. Next they'll strengthen the roof, adding depth to the existing hip rafter system for more insulation, and installing a system of collar ties and heavy trusses to stiffen and reinforce the structure. This week, we start with a look at the foundation work. In a coming issue we'll follow some of the wall and roof framing action.